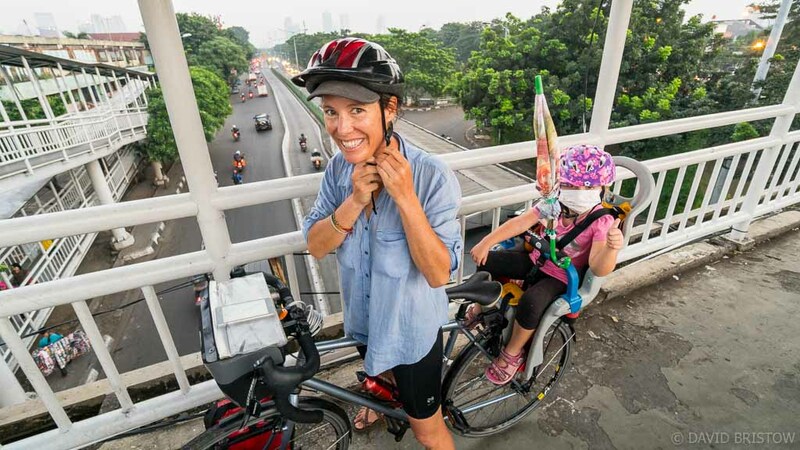 Cycling out of Jakarta is pure madness: the surging crush of motorbikes and buses, trucks and taxis, all racing and suddenly braking through impossibly slender streets. We dive into the mayhem before we lose heart, hoping like hell that nobody clips us and kills off this great Java adventure before it begins. 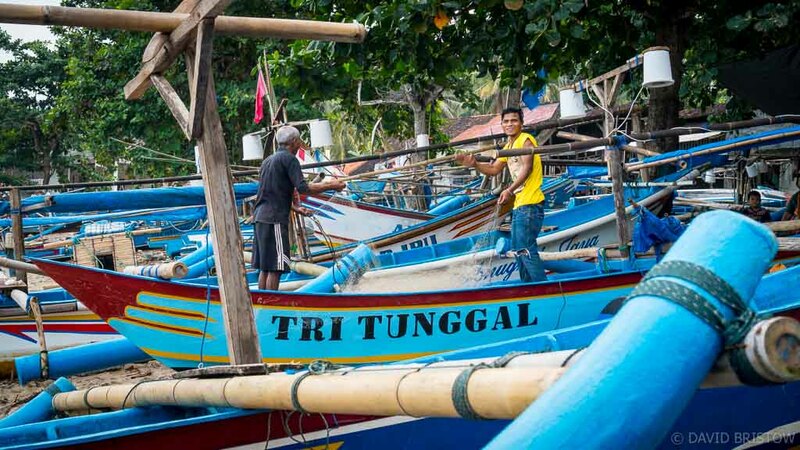 Escaping Indonesia’s most populated city is anything but the road-less-travelled. In a metropolis of more than 10 million people there are no empty roads, but for us, Java’s uncharted south coast awaits. First we must endure three white-knuckled days on the bikes, packed with collisions and epic spills, and one harrowing scene that almost derails the whole crazy adventure. There are skid marks and motorcycle debris and a body on the road that isn’t moving. Dave motions his finger across his throat and we push our bikes through the milling crowd with eyes averted, our heads full of ‘what ifs’ that leave us sombre and trembling. We find a hotel and debate whether to push on and fortunately, when we do, the road begins to empty out, rising and falling through verdant hills until we rip off our face masks at seaside Cimaja and breathe the fresh salty air. 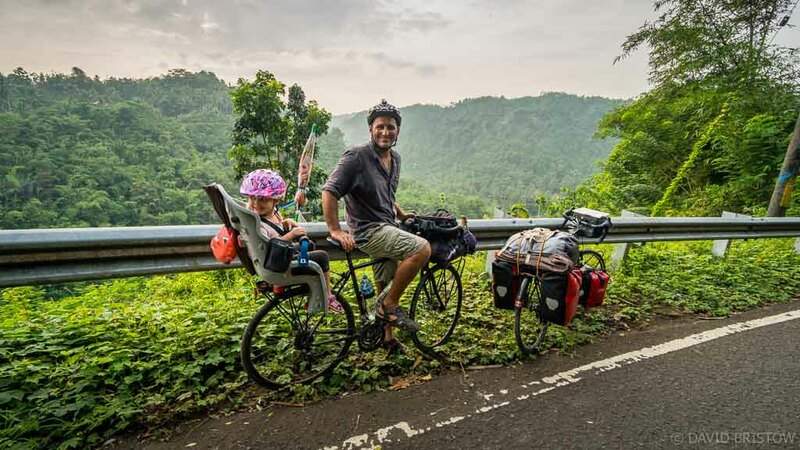 There’s a bungalow and a few Bintangs and ahead of us, a week’s worth of riding on a raw Indo coastline untarnished by tourist hotels and foreign languages, and certainly no cycle tourers with a four-year-old child on board. There are endless, grueling all-day climbs too, and language confusion of epic proportions, but we don’t know any of this yet, and the fact that our Google searches leave us in the dark about the route ahead only excites us all the more. We stock up our supplies of cash and biscuits, pack camping supplies as insurance against the villages we may not reach before dark and set out on the one of the toughest, most exhilarating rides we’ve ever experienced. 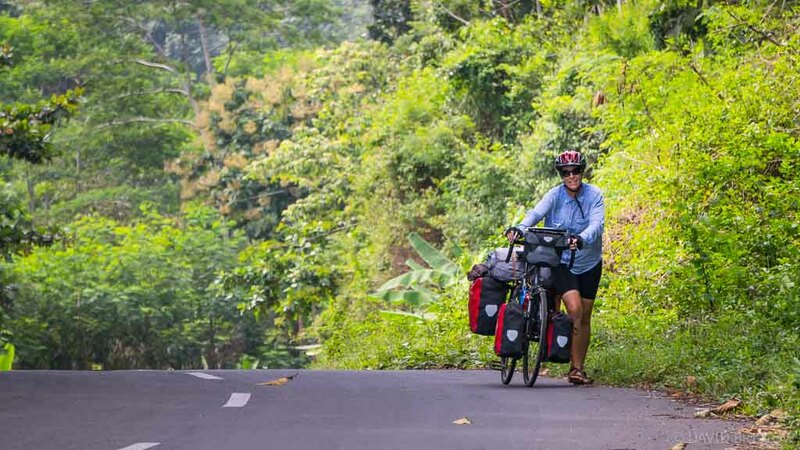 Beyond Cimaja we cycle out of our guidebook and into the unknown, beginning the long, unrelenting climb towards Jampang Kulon. Heads down, legs pumping, we inch ever upwards past towering forest giants draped with jungly vines and the occasional makeshift shack selling esky-cold drinks and fried bananas. It’s hot, damn hot, and that is takes half a day to cycle 16km and conquer the 1000 metre altitude gain speaks volumes about the gradient which inches ever upwards, just kind enough to keep us in the saddle but never leveling out enough to offer even the tiniest reprieve. When our calves burn we pause to take in the ever-improving views and give our four-year-old daughter her own leg stretch. Having already ridden pillion for over 1100km from Singapore to Thailand the slow way, she’ s as patient as ever, happily enjoying her side-on view of the world from the back of her dad’s bike. Halfway up the range at the only hole-in-the-wall shop for miles around, I suddenly realise that it’s our 16th anniversary. Miraculously, there are tiny squares of homemade chocolate cake for sale, and we celebrate over coffee milk and sweet iced tea. Back in the saddle, the slow, sunny day lulls our daughter Maya to sleep and while she snoozes, we top out and coast effortlessly through lofty tea plantations, rolling along in the chilly high altitude air and relishing the dramatic change of scene. It’s the high point of the day in every way, because after 5km, the road tips us back down towards the sea, rumbling over rugged gravel and braking into ridiculously tight corners. 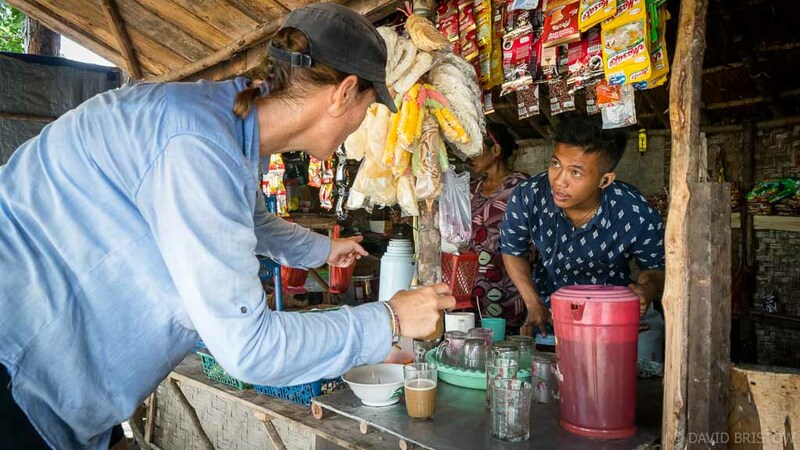 We refuel mid-afternoon on nasi goreng – simple egg-fried rice – and pedal on to end our 65 kilometre-long day in Jampang Kulon, a mouldy room at the local penginapan as our prize. The ‘deluxe’ suite costs us 100,000 rupiah (USD$7.50), each of the four beds equally musty, and after ladling ourselves with cold water scooped out of an oversized mandi, we sate our sizeable appetites on plates of cold tempeh, rice and fried greens. 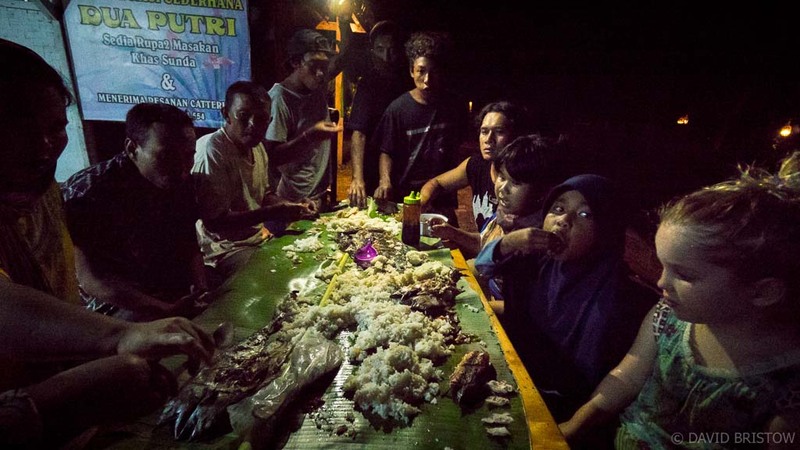 When we go looking for nightlife in Jampang Kulon, we return with ice creams and spend a less than romantic night sweating under a single fan whirring hopelessly against the humidity. It feels good to be out of bed and back on the bikes as we cruise downhill in the cool hours after dawn. 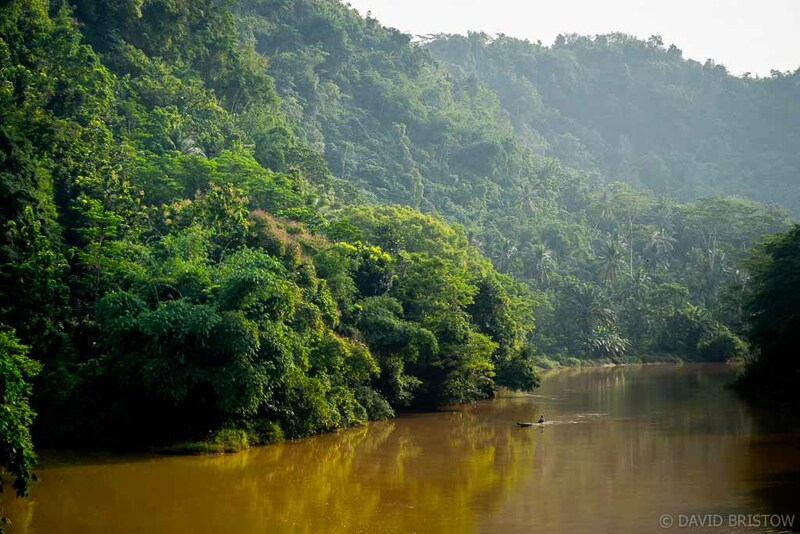 Rolling past neighbourhood mosques and verdant paddy fields, we spin downhill to cross the wide Cikaso River and wonder what dramatic waterfalls might be reached if we could muster enough Bahasa to convince a local boatman to take us up river. The morning’s freewheeling ends with a rugged uphill grind. I get off and push, cursing the camera gear and the laptops, the drone and the camping gear that are weighing me down. 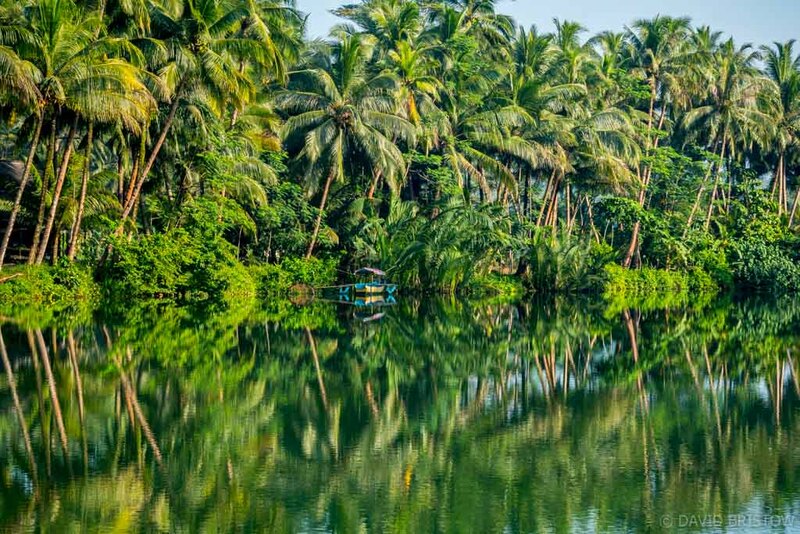 Rising and falling, the day finds its own rigorous rhythm and we stop to picnic in the cool of rubber tree groves, far from towns and villages and traffic and begin to feel the euphoria that peak fitness brings. At a tiny roadside shack in a coconut sugar plantation I string together enough mangled Bahasa to order two hot, creamy coffees and piles of fried sweet potato and bananas to fill our grumbling bellies, and in fleeting downhill runs that undo our hard labour we finally glimpse a breezy, beautiful sea. But before we reach it the road tugs us up and inland one more time and we don’ t return to the coast until we’ve endured a hot night in a window-less box, plagued by power cuts and bed bugs and eluded by sleep. At dawn in Sindang Barang, I get woof-whistled for the first time in Java while buying deep-fried tofu snacks from a street cart, and so begins the best day of our entire cycling adventure. Suddenly there it is: our first, big sky view of Java’s southern tricoloured coast: an endless sweep of white sand beach, squeezed between a fringe of coconut palms and the big blue beyond. This deserted, rapturous scene accompanies us all the way to Rancabuaya Beach where we find sanctuary in a breezy hilltop bungalow, perched above a perfectly arcing, bright blue cove where wooden fishing boats nudge onto a golden coral shore. Our daughter covets the bungalow’s swimming pool, and there are sand pagodas to build and discrete cold beers relished on our balcony while our beach-tired traveller sleeps and Indonesian bikers set off Saturday night fireworks. 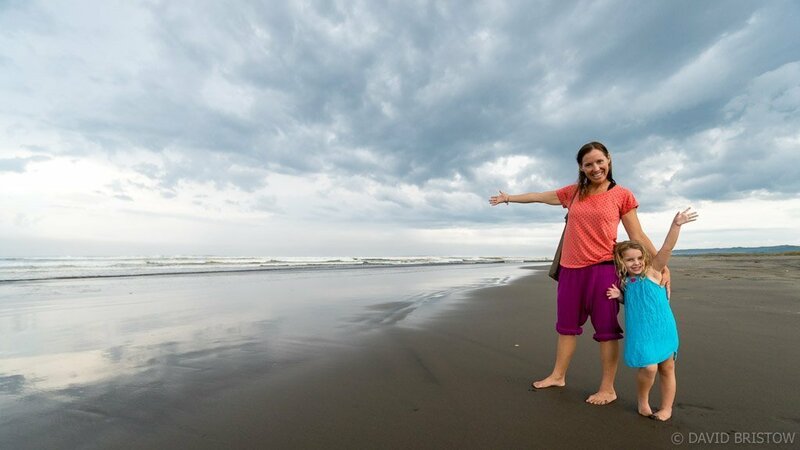 At 300,000 rupiah a night (USD$22), there’s little tempting us away from Rancabuaya so we fill another day with beachcombing and sand play and night swimming in the rain. When we do drag our little fish out of the pool and back onto the bikes, the worst of the south coast’s hills are behind us. We ride on, paralleling the coast for two blissful days past pure white beaches severed by braided green rivers and speculating, as perfect surf breaks peel off untouchable, deserted headlands, just where we might build that perfect beach bungalow. Reaching Batu Karas is bittersweet. 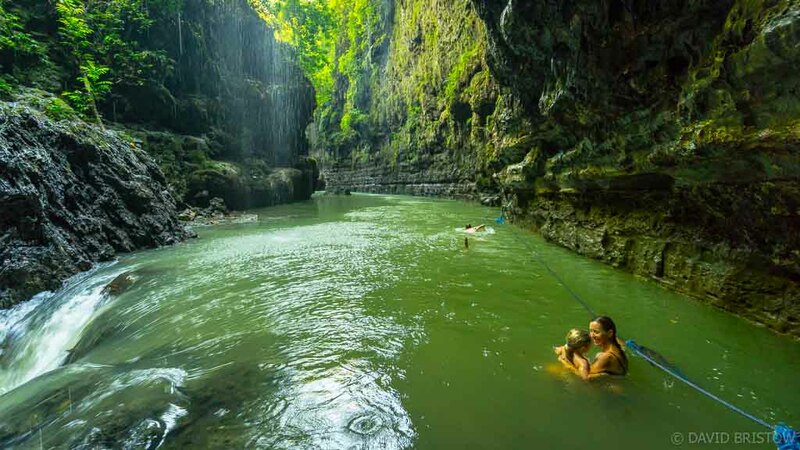 The thought of gliding through the soaring stone walls of nearby Green Canyon has moved us many miles on the bikes, but the town’s hyped up tourist scene leaves us all at sea. We check into a beachfront bungalow and stoke a beach campfire, sharing our hosts’ feast of just-caught, coal-cooked fish dipped into fiery sambal and served alongside mountains of coconut rice. Riverbanks whizz by until the canyon walls flare suddenly upwards, squeezing the emerald river into a rushing, narrow channel. We jump out and grab hold of a knotted rope to pull ourselves upstream, fighting the force of the chilly flow pushing us back. It’s a good thrill – cheap and fleeting – but it can’t hope to compete with all the freewheeling fun of the last few weeks. 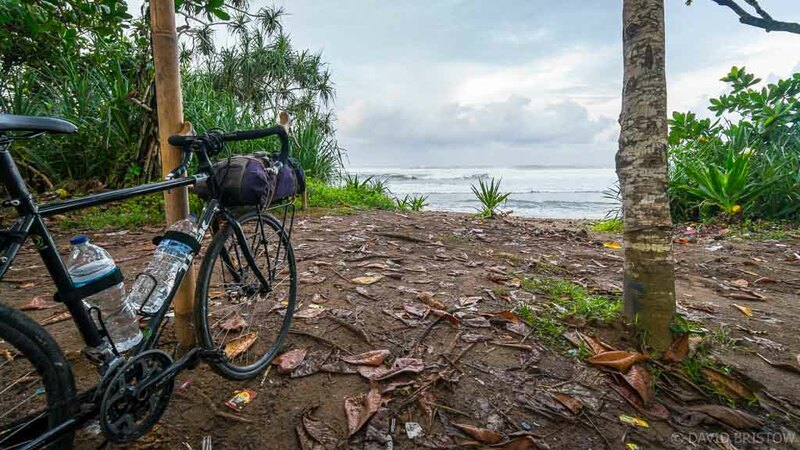 Covering new ground east of Batu Karas, we endure the 38km of crowded, traffic-choked streets that lead us to Pangandaran’s hopelessly touristy beachfront and become convinced that the best of our cycling is behind us. The beaches are dirty and dank bars hog the sand, so we throw our bikes onto a local bus, place a stack of rupiah in the bus driver’s hand and make a beeline for Yogyakarta. Off the bikes in this historical Javanese city there are back streets to wander and history to unearth. We play tourists, climbing Borobudur – Indonesia’s best Buddhist site – in time for sunrise Is Borobudur the world’s best Buddhist site, and lose our way in the underground tunnels that lead to Taman Sari – a secret Eden of water gardens and pools Discovering Java’s Secret Pleasure Pools. We shop and eat and swim in the hotel pool, and indulge in air-con and hot showers and beers with new mates. Looking back after cycling close to 2000km across five Southeast Asian countries, our time on Java’ s sublime, uncharted southern coast remains the most memorable. The sublime beaches, the all-day-long hills, even the excess of tempeh all added up to amazing adventure that will be difficult to beat. For anyone keen to escape the pack in Southeast Asia, this wild coastal route proves that the road less travelled is ready and waiting. Getting there: Jakarta, the capital of Java, is well connected by air and Air Asia (airasia.com) is a reliable budget choice. Cycling from Jakarta to Cimaja (160km) takes 2-3 days, and another five days to Batu Karas. 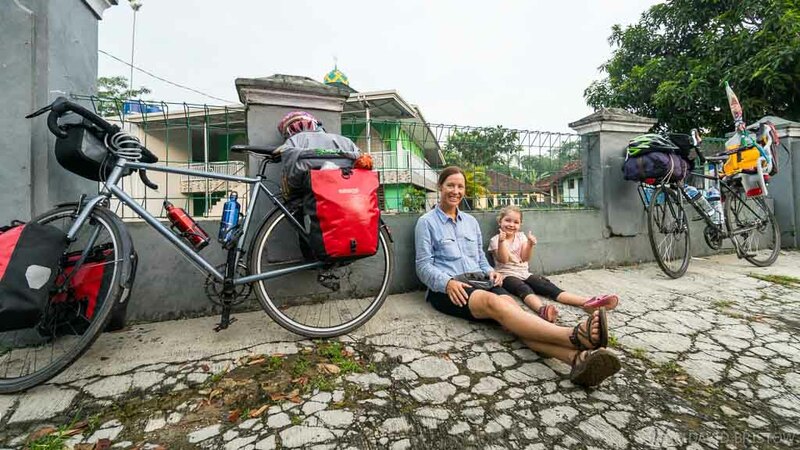 If Jakarta’s traffic puts you off (check out this story: add link here: Escaping Jakarta by bike), fly to Yogyakarta, pedal south to the coast and follow it west. 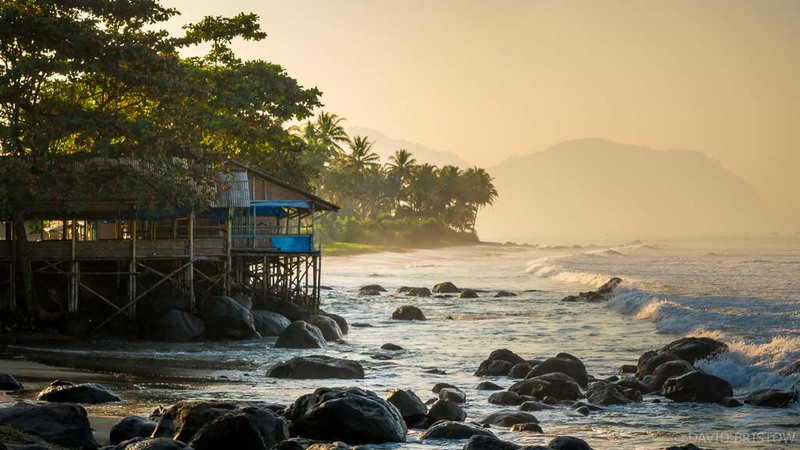 When to go: Temperatures vary little across Java but in May and June there is less rain and fewer tourists. What to take: Bring your own touring bike, repair kit and spares (Indonesians are motorbikers, not cyclists). 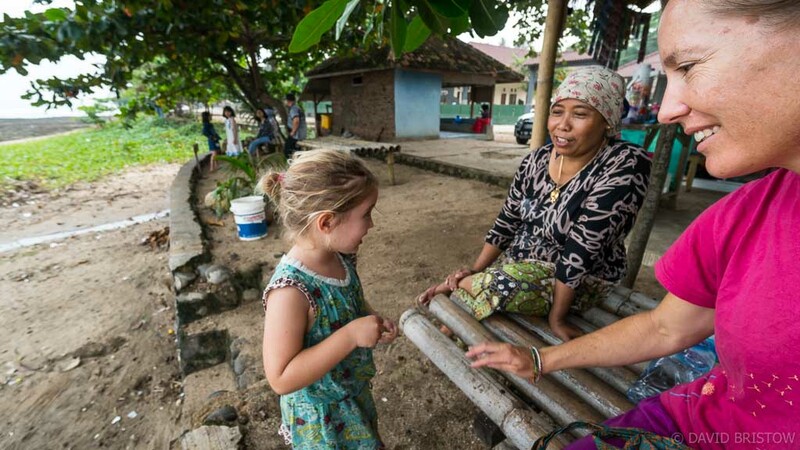 Carry lots of small currency, learn as much Bahasa Indonesia as you can, and be quick to smile (as locals do) when things don’t go to plan. Contacts: Off-line mapping apps Pocket Earth and Maps.me were helpful on the ride. 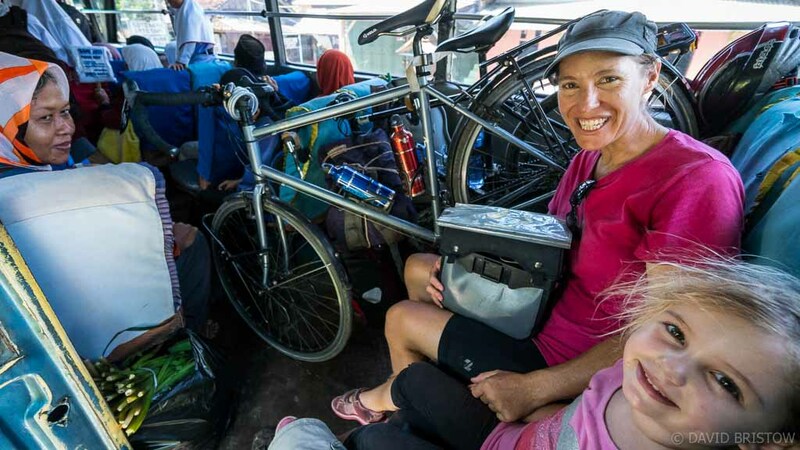 Join warmshowers.org (couch surfing for cyclists) to meet and stay with locals en route. Further Information: Cimaja’s BW Beach Café and Villas is a friendly beachfront choice (cimaja.com) and on the ride to Bata Karas, you’ll find basic local accommodation at Jampang Kulon, Sindang Barang, Rancabuaya (our favourite), Pameungpeuk and Cipatujah. I would go tomorrow but only on the back of someone else’s bike. You would love Java Leonie, no matter how you travel it!